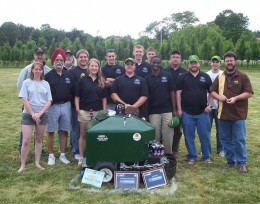 The Wright State University team placed first in the ninth annual ION Robotic Lawn Mower Competition. A team of Wright State University engineering students and faculty took home the top prize at the ninth annual ION Robotic Lawn Mower Competition held at Siebenthaler’s Beaver Valley Garden Center in Beavercreek. The team placed first in the advanced category. Challenges in the advanced category included precision mowing (against a picket fence and around a flowerbed) and avoiding a radio-controlled poodle. Wright State was the only team to complete the task on its first attempt. In the advanced category, teams must navigate around a fence and a flowerbed. The machine also had to avoid a radio-controlled poodle.